Who were these noble-minded people of Berea? From verse 10 we know they were Judean and met in a Synagogue in Berea. Berea was located in South Western Macedonia, South of Thessaloniki and North of Kosovo, between Albania and Bulgaria. What else do we know just from reading verses 10 and 11 of Acts 17? How were the Bereans not like the Thessalonians? 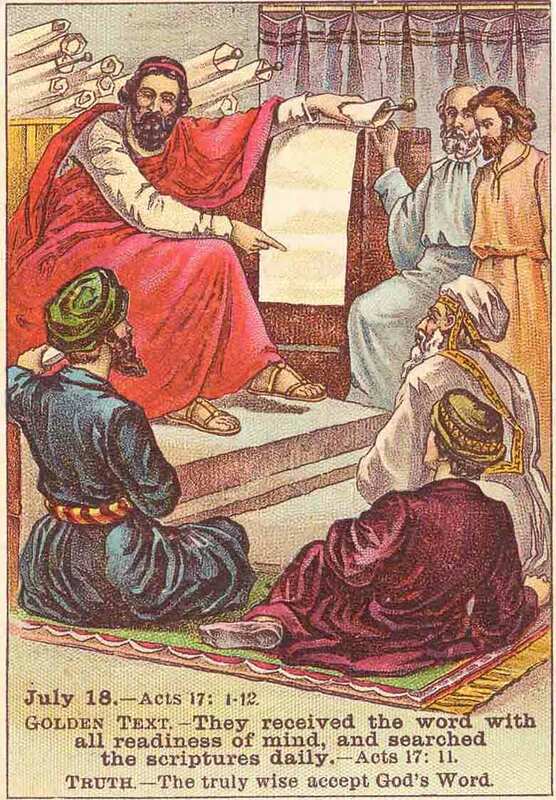 Unlike the religious leaders of Thessalonia, the Bereans examined the Scriptures daily to check to see if any new teaching was true or false. They received Paul’s message of the Good News of God’s Kingdom eagerly. Unlike the Thessalonians they were not fearful of false prophets because they knew how to check for Truth by holding it up to the plum line of YHVH’s unchanging Truth. The Scriptures consisted of the Torah and the Prophets, those who spoke the Words of YHVH. These were the Scriptures Y’shuah referred to as testifying about Him, John 5:39. You know we still have access to the same plum line of Truth that the Berean’s examined daily. We do not need to fear being deceived by any new teachings, doctrines or opinions that don’t align with the Light of Truth. Still today we see how many, like the Thessalonians, are not open to searching out what is True. To be close minded and opinionated comes from fear. Whether we fear being deceived or we are just too proud to reassess some of our comfortable traditions and customs, fear shows itself in every indignant, prideful and hate-filled reaction. Are you confused, angry or just plain fed up with all the religious divisions in the world? Truth tells us God is One, so there cannot be any division in Truth. Yet I was being blown around like a wave in the sea by every influential teacher I heard. We are only teachable when we are humble, with a child-like attitude. As adults we have a hard time letting go of the teachings, doctrines, traditions and human opinions we have grown accustomed to. It requires great courage and trust to be Set apart. The Way of Truth is Counter-Cultural. The way of the world is not the way of Truth. Following the Way of Truth is the difficult Way. Truth is not an opinion to argue or defend, that would be like arguing gravity. It requires only that someone hold up a Plum bob to show reality. The Truth has been revealed to all mankind, like a light in the darkness, it always was, is and always will be Truth. Truth seekers have no concern about which person to follow or whom to ask about Truth because YHVH has put His Spirit of Truth in each one of us, young and old.. He is the One we ask, the One we teach our children to seek diligently and the only One we trust. We are no longer dead, (separated) spiritually because of our iniquity, check and see. Jeremiah 31:33,34. Truth, Who is Open to Receive Truth?